Back in February, I spotted how Ask.com was showing up to five Google search ads above the organic search results. It only happened when using Internet Explorer on a PC, because (I guess here) the Ask.com team didn't want to upset the early adopters who use Firefox and Safari or a Mac. Yes, it is even hard to distinguish between the background color of the ads and the organic results. 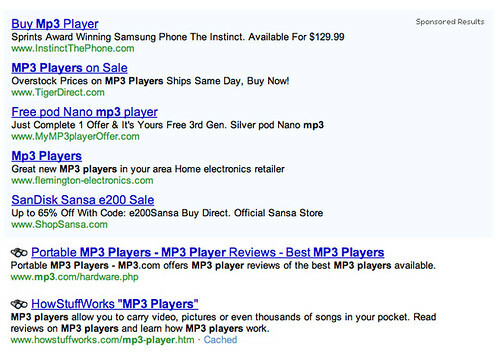 Back in mid-2005, Ask promised us to reduce the search ads in order to focus on relevancy and a better search experience. But that seemed to have gone out the window with Ask.com new Diller strategy. Q: I asked Ask Jeeves why they bury the Teoma results way under the Google AdWords results at Ask Jeeves? A: Michael answered that is was not about not being more relevant, they feel Teoma is more relevant than AdWords. But it is set up that way from a monetization standspoint only. Fair answer. Seems like we are back in 2004. Sad but true. Previous story: Does Chrome Signal The Removal of Google's PageRank Indicator?